CONS: You must have a direct line-of-sight between the infrared transmitter and the speaker for it to work. SUMMARY: The TV Ears11290 5.0 is easy to operate, wireless speaker that will benefit users who have a hard time hearing TV dialogue. It does an excellent job of raising the sound of voices while lowering the background music for more enjoyable television watching. This unit is especially useful for users who don’t like wearing headphones or earbud (but you can also wear them with this speaker if you choose). The TV Ears Wireless Speaker is a device that was designed to help viewers hear TV shows more clearly. As most people with hearing loss know, one of the most contentious issues with family members is the level of the sound of the TV. This device uses voice clarified audio to make TV watching more enjoyable for everyone. You place the speaker near (on a shelf or side table) the person with hearing loss, and they can adjust the volume to their desired level of sound, while everyone else can listen to the TV at a level that they prefer. It will work with any television brand and can be used with or without hearing aids. This speaker provides up to 90dB of volume to accommodate almost any hearing loss needs. A lot of people use personal sound amplifiers to watch TV, which is fine. However, most amplifiers just amplify the sound, so it amplifiers everything – including background noise. When the music on a TV is playing while people are speaking, it becomes challenging to hear the dialogue. What the TV Ears speaker does is it uses something called Voice Clarification Circuitry, to help amplify human speech frequencies above the background noise. This technology ensures that spoken words are audible. Does it work perfectly? Not entirely, but if you are having trouble understanding voices on TV, it will help. TV Ears boosts only human voice tones, separating voices from the background, making it much easier to understand what people on TV are saying. The wireless speaker also operates independently from the television’s volume, allowing you to turn the television’s volume down or completely off. You can use this speaker with or without headphones. A lot of people don’t like wearing headphones, so this is a good option for them. One thing to keep in mind is that the speaker needs to be placed near the listener and not the TV, so depending on your room setup you may want to consider whether you have a convenient place to put the TV Ears Speaker before purchasing. You will also need to have a standard electrical outlet to plug in the transmitter and the receiver (speaker). This speaker is straightforward to use; there is just the one volume knob. If you are shopping for someone who doesn’t like or has a hard time using small devices with small buttons this device couldn’t be easier to use. Since the unit needs to be near the listener, it is a good product for people with limited mobility. 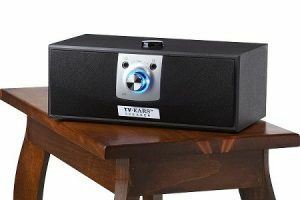 Since the TV Ears Speaker uses infrared technology, it must maintain a line of sight with the transmitter to function. It works in much the same way as a TV remote control. I would say that the range is pretty limited for this type of device, but if you are staying in one room and are not planning on moving around, then this device will be okay. The speaker can cover up to 600 sq. Ft. If you are looking for a TV speaker that does not require line of sight and can work in another room, you can try the Serene Innovations TV Sound Box. The product comes with very detailed instruction on how to set up the device. The hardest part is putting the right cords in the right inputs, but the manual covers how to do this so you won’t have any trouble. If you do get stuck, TV Ears have outstanding technical support that will help troubleshoot any problems that you are having. All of the cords that you need to connect your TV with the receiver come with the unit. The TV Ears speaker will work with any brand of TV. You can use headphones or earbuds with the device; there is a headset jack in the front of the unit that will take any standard headset or headphones as well as music in jack. The power supply is 110v. Audio input connection for a music player or smartphone. It has digital connectivity with Dolby, SRS, and PCM compatibility. The television and headset volume function separately. The unit comes with a 30-day money back guarantee; if you don’t like the product, you can return within 30 days of your original purchase for a full refund. It also has a 5-year limited warranty that covers product failures due to manufacturer’s defects for five years after the original purchase. If the product fails within the five years, it will be replaced for 50% off MSRP with the same or newer model of equal value. TV Ears has an excellent customer service reputation. You can contact them in a variety of ways; they have a customer service phone number 1-888-883-3277. Or if you need technical support or information about the warranty call 1-866-611-9934 from 6 am to 6 pm PST Monday through Friday. 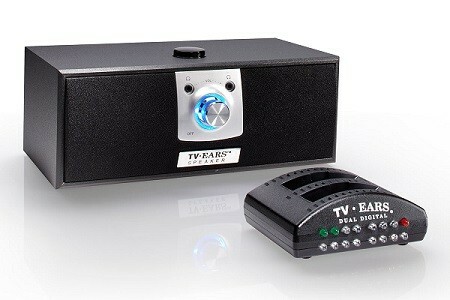 The TV Ears 5.0 TV Listening speaker comes with everything you need to set it up with any TV. There is a transmitter, speaker, AC adapters as well as digital and analog audio cables to connect to your TV. The size is 11″W by 5 1/2″ D by 4″ H.